APIA, Samoa, December 3, 2014 (ENS) – Pacific fishing nations have reached agreement on new rules for the conservation of Pacific Bluefin tuna, a species that is nearly fished out to serve the lucrative sushi trade. The agreement was reached at the 11th session of the Western & Pacific Fisheries Commission (WCPFC) Tuesday in Apia, where 33 member states and territories of the WCPFC are meeting through Friday. Scientists advising the Commission say Pacific Bluefin tuna numbers are down to just four percent of their historic levels. Only a tiny breeding stock now approaching the end of its lifecycle is holding that population together, says Alfred Cook, the WWF’s Western and Central Pacific Tuna Programme Manager. The new conservation rules require bluefin tuna fleets to keep catches below the 2002-2004 annual average levels. 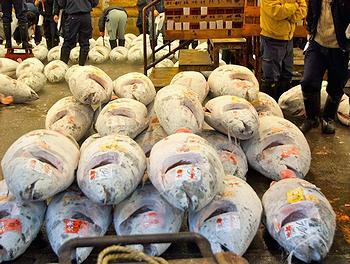 Catches of bluefin tuna under 30kg each are to be reduced to 50 percent of the 2002-2004. If the catch limit is exceeded, the over-catch will be deducted from the following year’s catch limit. “The commission must demand member parties such as China, Japan, Korea and Chinese Taipei begin supplying basic catch and effort data for their fishing fleets,” said Cook. The meeting in Apia follows October’s decision by the Inter American Tropical Tuna Commission (IATTC) to almost halve catch quotas for Pacific Bluefin Tuna in the eastern Pacific Ocean. The two commissions include some of the same member countries. Pacific bluefin fetch high prices at auction due to the demand for their flesh at the world’s sushi counters, especially those in Japan, where about 80 percent of all bluefin tuna caught worldwide is eaten. Sushi restaurateur Kiyoshi Kimura paid 7.36 million yen (about $70,000) for a 507-pound (230-kilogram) bluefin tuna in a January 2014 auction at Tokyo’s Tsukiji market, according to the AP news agency. Still, the price is far below what he paid the previous year. Bluefin are the largest of the tuna species, and individual tunas can live up to 40 years. They migrate across oceans and can dive to a depth of more than 4,000 feet. 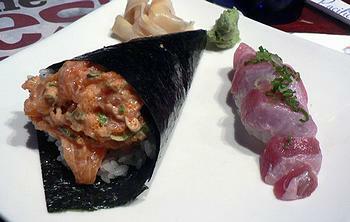 There are three species of bluefin: Atlantic, the largest and most endangered, Pacific, and Southern. Most catches of the Atlantic bluefin tuna are taken from the Mediterranean Sea, which is the most important bluefin tuna fishery in the world. In the Atlantic and Mediterranean, bluefin tunas face a more deadly future than their Pacific cousins. On November 17, the International Commission for the Conservation of Atlantic Tunas (ICCAT) concluded a special meeting in Genoa, Italy, by agreeing to a rapid increase in the Mediterranean bluefin tuna fishing quota. Atlantic and Mediterranean fishing nations agreed to a quota increase of nearly 20 percent every year for the next three years. Current signs of an ongoing recovery in the bluefin tuna population in the East Atlantic and the Mediterranean have generated “over-optimistic expectations from a part of the industry and certain fishing nations, which have asked for dramatic catch increases, ignoring warnings from scientists that any increase in catch levels should be moderate and gradual,” warns the WWF. “It’s time now for fishers, traders, retailers and consumers to take greater responsibility to ensure that bluefin tuna recovery fully materializes and is a long-lasting reality,” Dr. Gemma Quílez-Badia, fisheries officer at WWF Mediterranean. In this year’s ICCAT meeting, fishing possibilities for the Western Atlantic bluefin tuna stock also were increased. 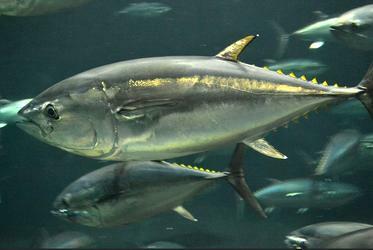 Other Pacific tuna species are also at risk. Bigeye tuna stocks are at only 16 percent of historic levels and heavily over-exploited, while worrying declines are occurring in stocks of skipjack, albacore, and yellowfin tuna. At the Apia meeting, Samoa expressed disappointment with the Philippines position against changes to the conservation regime for bigeye, yellowfin and skipjack tuna. At a press conference, Joyce Samuelu Ah Leong, principal fisheries officer of Samoa’s Ministry of Agriculture and Fisheries, said the current regime is placing a disproportionate economic burden on Pacific island countries. While each country is entitled to its own opinion, said Ah Leong, the 17-nation Forum Fisheries Agency had been looking forward to more consultations and negotiations during the forum. Members of the South Korean delegation to the Apia meeting also resisted changing the conservation rules for these tunas, saying evaluation of new measures adopted last year has not yet taken place.